Cairo [pronounced locally as “Kay-roh”], at the southern-most point of Illinois, was one of the key strategic locations for the first two years of the Civil War. 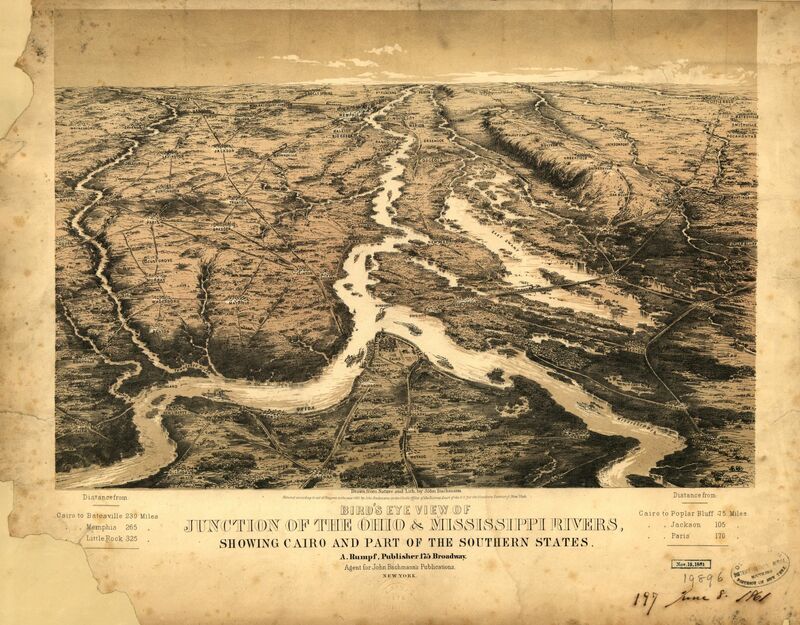 A muddy and rough riverport, Cairo lay at the junction of the Mississippi and Ohio Rivers, and potentially held the key to entering the Western Confederacy by water… up (or down) the Ohio and then into Kentucky and Tennessee by way of the Cumberland and Tennessee Rivers. It was also a key rail junction, the southern terminus of the Illinois Central Railroad. From the earliest days of the war, its military value had been clear and it had been garrisoned and fortified, first by the Illinois militia (rushed down on the Illinois Central), and later by an astounding assortment of Army and Navy forces based at “Fort Defiance” under Brigadier General U.S. Grant (commander of the District of Cairo). By late 1861, the early Illinois troops would be joined by thousands more, and a fleet of ironclad river gunboats constructed by engineering genius James B. Eads. 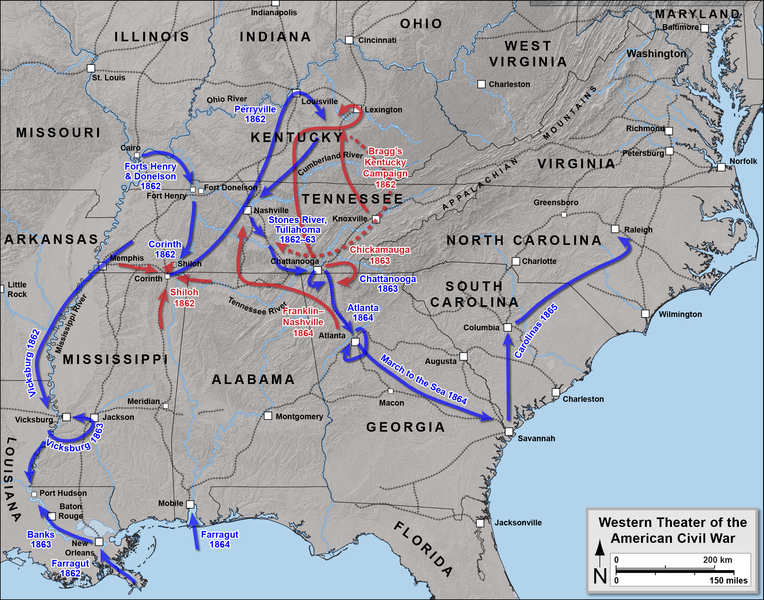 There the Federals engaged in a stand-off, and light sparring, with a Confederate army under General Leonidas Polk. In early ’62, Grant’s amphibious host, swollen by a fleet of transport steamers from St. Louis, would ascend the Ohio to begin the successful attacks on Forts Henry and Donelson, which would crack open the defense-line of the Western Confederacy and flank Polk out of his defenses. The map is an extraordinary one. 19th Century maps can be artistic as well as informative, and this wonderful piece more than most. In the 1850s and 60s illustrator John Bachmann created a number of astonishing “Bird’s Eye” depictions of towns and regions, and here he gives the junction of the two mighty rivers his unique treatment. He defies convention by putting south at the top of the image, with the Mississippi entering from the bottom right, and the Ohio from the bottom left, to converge at Cairo, and them ascend south up (!) past Memphis towards the far off Gulf of Mexico. Bachmann gives us a busy mix of the natural and man-made with streams, bluffs, swamps and groves, dotted with named towns and criss-crossed with road, rail, and bridges. Steamers ply the waters and Tennessee and the Cumberland…targets of Grant’s invasion in a year’s time… reach off to the left from either side of Smithland, KY.
Levee-bound Cairo is in the center foreground, with its shipyard suburb or Mound City, destined to be the headquarters of the Western Gunboat Flotilla (later the Mississippi River Squadron). Just south of Cairo is (on the left) Columbus, KY and around a short bend (to the right) Island No 10 and New Madrid, MO. All would be occupied by the Confederacy, and Columbus’ towering heights would be fortified by the CSA as the “Gibraltar of the West”. This vaunted outpost was destined to be flanked by Grant in February, 1862 and abandoned without a fight. All that is in the future here though. Bachmann shows us Cairo and the great confluence, in the last moments of peace in 1861. He also shows us all of the terrain…human, terrestrial, and riverine…which would define the War in the West in the crucial early months of 1862. The state of Missouri is unusual, in that it fielded a large number of both U.S. and CSA units of state volunteer troops. 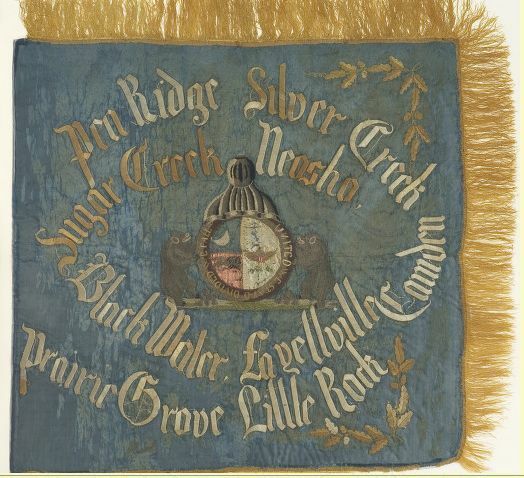 At the link below you can examine infantry, cavalry and artillery flags from Missouri units on both sides of the “Brother’s War” in addition to the personal flag of Confederate General (and later Missouri Governor) John Sappington Marmaduke and the captured flag of the “Beauregard Rifles” (possibly the flag of Company “A”, 9th Alabama Infantry”). The flags, often with major wear and battle damage bear a variety of battle honors, including most of the great battles of the Western Theater, including Ft Donelson, Shiloh, Corinth, and the many battles of the Vicksburg, Chattanooga, and Atlanta Campaigns. Many also bear the names of lesser known fights from Missouri’s bitter “civil war, within the Civil War”, fought between Missourians as they struggled for control of the state: Black Water, Silver Creek (Roan’s Tan Yard), Lone Jack and Neosho. Of special interest are the special “Veterans” flags issued to by the (Unionist) state government of Missouri to units which reenlisted at the end of three years service. The blue flags bear the state arms (rather than the Federal eagle) in gold, with the word “Veterans” and the unit designation on the reverse. These flags tell a story of the contest for legitimacy, and the Unionist’s claim to recognition as the lawful government of the state. At the beginning of the war, the secessionist Missouri State Guard had designated a blue flag with the state arms in gold (the unofficial state flag in common use) as the State Guard battle flag. By issuing Federal veteran units the state flag in its own name, the Unionist government of Provisional Governor Hamilton Gamble was making the public statement that his administration, not the government-in-exile of Missouri’s Confederates, was the legitimate government of Missouri. 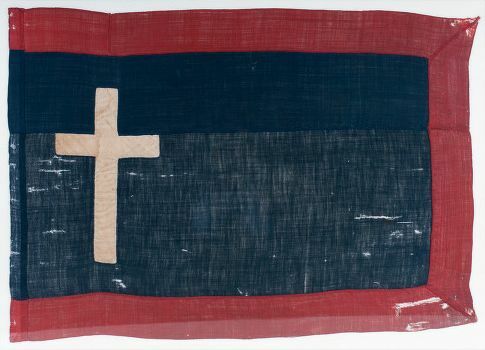 As for Missouri’s Confederates, they are represented as well, with both the “starry cross” of the commonly known Confederate battle flag, and examples of “Price’s Flag” (aka the “Missouri Battle Flag”) popular with many Missouri Confederate regiments in the later part of the war (a blue flag, bordered in red, with a white Latin cross near the fly). So, click on the link below, and enjoy the fine work the conservators in Missouri are doing, and all the great things the state staff and volunteers in Missouri are doing to preserve and publicize the history of America’s most divided state. The Civil War Trust has announced the winners of its 2013 Photo Contest. Jointly sponsored with the History Channel and the Center for Civil War Photography [ http://www.civilwarphotography.org/ ] the contest features photographers engaging and interpreting historic Civil War-related sites, often in new and interesting ways. The Anaconda Plan, is the (retrospectively) un-ironic name given to the much modified but eventually successful Federal Grand Strategy to win the Civil War. 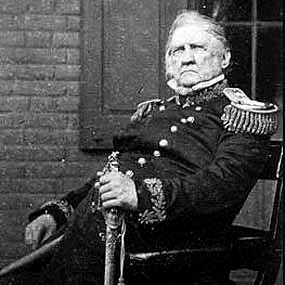 The (very) rough outlines of the plan were sketched out by U.S. Army General-in-Chief Brevet Lieutenant General Winfield Scott in May of 1861. General Scott envisioned a grand envelopment (a crushing Anaconda in the public mind) which would divide, isolate, and economically cripple the seceded states. Scott wished to avoid a “war of conquest” if possible, so he called for a naval blockade to isolate the seceded states from foreign markets and imported goods. His main military action was to be a huge offensive down the Mississippi River, seizing key points along this strategic artery to put in under Federal control all the way down to the Gulf of Mexico. Scott did not wish to have to force the “insurgent States” back into the Union as “conquered provinces”, and he believed that there was significant “latent Unionism” in the seceded states which might be rekindled (a view Lincoln shared at the time). Isolation from foreign markets, a drought of luxuries, and economic collapse might, in Scott’s mind, bring many of the insurgents back into the U.S. with a minimum of destruction. At the time Scott’s concept was widely derided. The label “Anaconda Plan”…or “Scott’s Great Snake”….came from enemies of the Plan, or of the Administration. Unionist fire-brands who supported a more direct “on to Richmond” strategy dismissed it as passive and weak. Peace Democrats and Confederate commentators dismissed it as doomed to fail, and as foolishly underestimating Confederate determination to break away. In the end, Scott DID underestimate the Confederate will to fight and willingness to accept privation to achieve independence. The Confederate population proved willing to not only forgo luxuries, but bore up under economic collapse and serious food shortage. Still, Scott was right that the blockade would be a key to victory, and that a long complex campaign on the Mississippi (far from the dueling capitals) would be vital to eventual success. Scott also saw something that few did at the time: that it would be a hard, LONG war. At the time of the plan’s origination, most Federal volunteer troops were “Three Months Volunteers”, mustered for 90 days service under the Militia Act of 1795. Scott had little use for the Three Months Men, as they could hardly be armed and partially trained before them would be mustered out. His main hope for these short-term volunteers was that they might receive some military instruction during that period, so they could be more useful as recruits for future “Three Year Regiments”. At the time, many commentators, North and South, still believed the war would be over in a matter of months. Scott’s plan for the (Anaconda-like) slow crushing of the Confederate economy, was eventually put into place, although with the addition of the conquest and attrition Scott hoped to avoid. 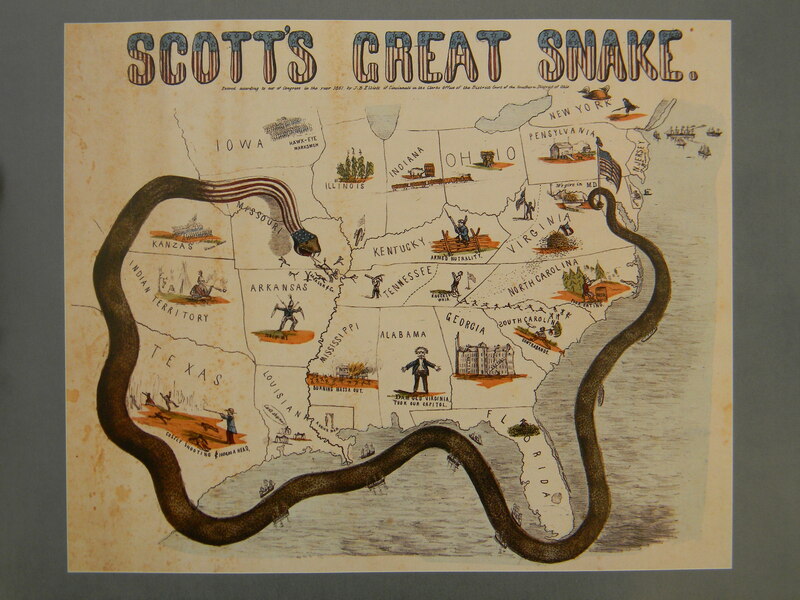 The wonderful graphic of “Scott’s Great Snake” presents a great Federal “Anaconda” …studded with Navy ships…..wrapping around the southern states, and curling around to plunge, snake head-first down the Mississippi. It was created by J. B. Elliott of Cincinnati in 1861. But in addition to the Great Snake there are numerous other miniature images, often commenting on current (to 1861) views of states or recent events. The snake’s tail is anchored to an American Flag at Washington, topped with a liberty cap. A enthusiastic zouave, in puffy red pants, charges out of New York, as a winged helmet emblazoned “Free Trade” hovers overhead. Maryland declares “We give in” as a bridge burns on the MD/VA border. A West Virginian defends “The Old Flag” with a sword, as the rest of Virgina is symbolized by a battered bee hive, topped with a tattered Confederate Flag [First National pattern] hanging from a broken staff. A North Carolinian notes that pine rosin is “Poor Eating”, while “Contrabands” escape slavery in South Carolina. The Georgian cotton factory is abandoned and wrecked, while a lone Floridian sits in a swamp. Tennessee is divided, with the Unionist “Knocksville [Knoxville] Whig” [Newspaper] leading East Tennesseans in defending the American Flag. In West Tennessee a secessionist in a cocked hat looks for threats across the Mississippi. 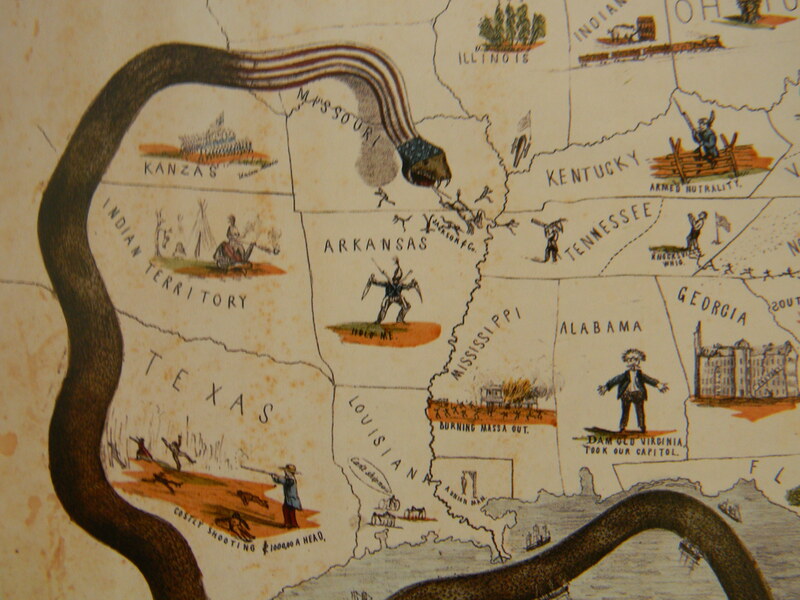 There, the Great Snake is chasing out Missouri’s secessionist Governor, Claiborne Fox Jackson (the fleeing jackass), while an over-armed Arkansan wields two Bowie Knives and wearing two muskets over his shoulders. A native chief smokes a pipe in Indian Territory [Oklahoma today], while in “Kanzas”, marching feet make “Union Music”. A second battalion of “Hawk-Eye Marksmen” march south, while a cannon points south from the Federal redoubt at Cairo [pronounced Kay-Roh] Illinois, where Ft Defiance guards the junction of the Ohio and the Mississippi. As we discussed, the passage of the Kansas-Nebraska Act (1854) officially repealed the Missouri Compromise of 1820. It also triggered a struggle for control of the Kansas Territory, to determine whether Kansas would (eventually) be organized a a Free Soil or slave-holding state. Most pro-slavery activists felt that, regardless of the Popular Sovereignty claims made by proponents of the Act, the “unspoken bargain” had been that Kansas would be organized as a slave state (to balance out the more northerly potential state in Nebraska, where no one believed plantation agriculture could survive). While most immigrants into Kansas were only interested in the opportunity of becoming land owners, others traveled there specifically to join the struggle over the state’s destiny. In the short term, pro-slavery activists had a great advantage in electoral politics, as “armed voters” could cross the border from slave-holding Missouri on polling days, to stuff the ballot boxes in support of pro-slavery government in Kansas. Violence was not long in coming. Hello to all the new USF OLLI scholars! It was great to meet all you fellow students of the American Civil War today! As we saw, the issue of how the people of the U.S. got to the impasse that led to the “Late Unpleasantness” is a complicated on….and one that PHDs (and others) will continue to argue about. Over the next few days, I’m going to look for media that deals with the road to war. Be sure to explore this page. I have socked it with links to some of the most scholarly and interesting blogs available, and the Resources let you explore important data, media and primary sources. Looking forward to getting smart together! Missouri folk duo Kathy Barton and Dave Para sing a two-song melody of songs from the Free Soil side of the Missouri-Kansas Border War [aka, “Bleeding Kansas”]. 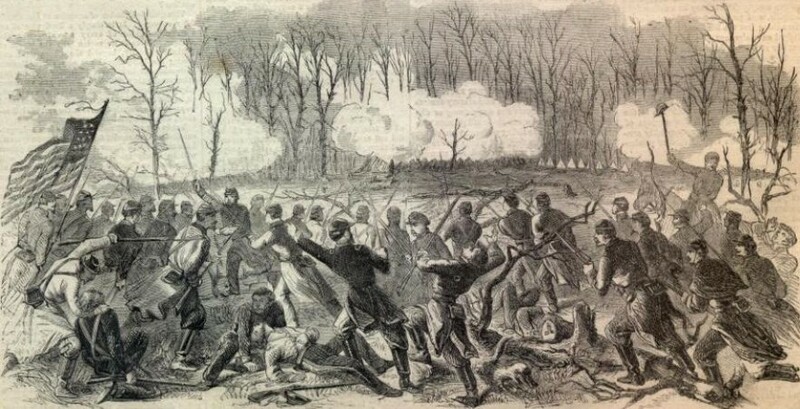 Fighting between pro-slavery and Free Soil settlers helped radicalize people in the trans-Mississippi region, and push the nation at large towards war. The radicalization of actors in the Border War may have been a cause for some of the extreme violence seen during the region’s guerrilla conflict during the subsequent Civil War. The song describes the Free Soil faction in Kansas as harbingers of freedom and democracy. The images mostly depict the fighting in Kansas from the Free Soil point of view. Pro-Slavery activists and most Missourians would take great issue with the characterizations presented in both the songs and imagery. At the link above, you will find an exceptional map showing the vast scale of the Western Theater, and the huge distances covered by the victorious Federal armies in the West. 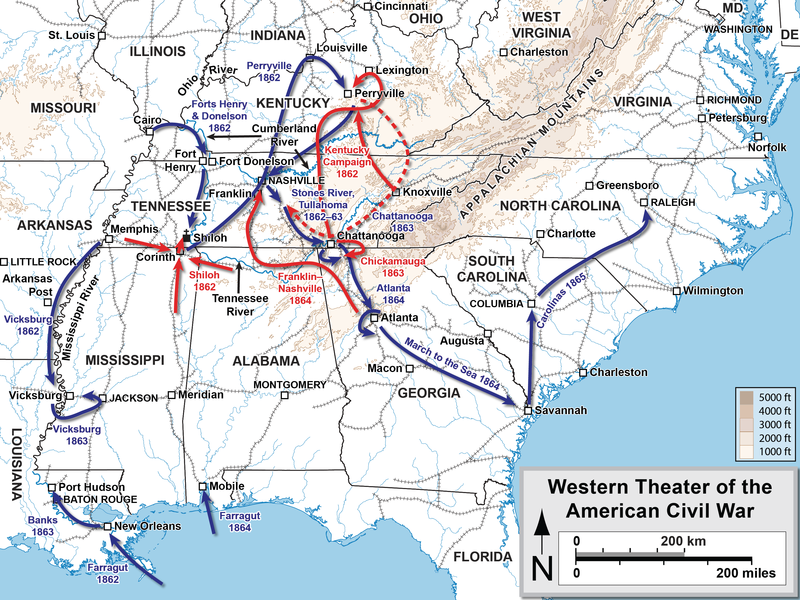 The westerners not only decisively defeated Confederate forces in their region, but marched East to capture all of the eastern Confederacy south of Virginia. Hal Jespersen has created a large number of excellent scholarly maps of battles and campaigns of the American Civil War. You can explore them all at the link in the resource section of this blog page. Written by James M. McPherson, this is the first history to examine Lincoln as a military commander, and the interaction between the Army (and Navy), policy and politics. It takes a national (and international) view of Lincoln as war commander. For students of the War in the West, it shows the importance of that region as the Theater where the war was won (and lost). It also follows Lincoln’s long search for a commander who could manage the (Eastern) Army of the Potomac. In the end, McPherson shows that it was in the West that Lincoln found the men to lead the Eastern army, and ensure that the two main Federal forces (the Army of the Potomac and the “Military Division of the Mississippi” finally worked in concert. Understandable to the newcomer, and enjoyable to the veteran scholar. Available in most public libraries.